In 2013, our certified dealer Hector Ruiz of Ruiz Distribución, came to us with a project in Sonora, Mexico. Ruiz, who specializes in the importing of home goods, has a facility in Arizona. 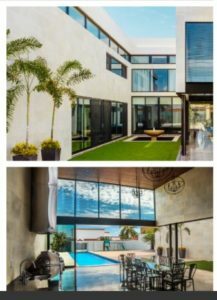 Ruiz also has a location in the city of Huatabampo, Mexico; where homeowners and architects can experience our Vari-Slide™ in person. From there on, Ruiz arranged the delivery of the materials to the job site in the city of Obregon; the second largest city in the northern state of Sonora. Architect firm Elias Cruz Arquitectos provided detailed renderings of the modern home. The contemporary design called for large expanses of glass to provide sweeping views of the pool and gardens. Most noteworthy, the plans featured a glass enclosed lower terrace. As a manufacturer, we specialize in custom projects and making our customers’ dreams a reality. To accomplish this sleek design, we crafted multiple moving panels in a single standard frame. Consequently, this created the appearance of moving glass walls with slim profiles and a perfectly clean look. In addition, we provided 3000 series sliding and fixed windows, as well as 4500 and 4550 door assemblies. Lastly, we fabricated all of the window and door products in a bronze anodized finish. Casa Norte was featured in the October 2015 issue of Muros – an interior design magazine based in Hermosillo, the capital city of Sonora. Muros, directly translated as “walls,” highlights architecture and design culture in the state of Sonora. Click here to flip through the digital version, and proceed to page 30 to see the full write-up (in Spanish) on Casa Norte.